Thank you for inviting me to participate in the second of your two-part series of hearings on the Social Security Administration’s (SSA) representative payee program. Today, I will discuss how we monitor the payees who assist our most vulnerable beneficiaries. I am Marianna LaCanfora, Acting Deputy Commissioner for Retirement and Disability Policy. Early on in Social Security’s history, Congress recognized that some beneficiaries were incapable of managing their benefits and amended the Social Security Act to allow us to appoint representative payees for such beneficiaries. Representative payees help these individuals by managing their benefit payments to fulfill their basic needs. We appoint representative payees, as needed, for adult and child beneficiaries under Social Security’s retirement, survivors, and disability programs, and for adult and child recipients of the Supplemental Security Income (SSI) program. Over half of the individuals with representative payees are minor children. It is important to note that we presume adult beneficiaries are capable of managing or directing someone else to manage their benefits, unless there is evidence to the contrary. This presumption does not apply to adults who have been determined by a court to be legally incompetent or to minor children; under our regulations, we usually must pay those individuals through a representative payee. In all other situations, we will consider appointing a representative payee when we learn that a beneficiary has a mental or physical impairment that may prevent him or her from managing or directing the management of his or her benefits. In that case, our field office employees make a capability determination, using criteria set forth in our regulations, to see whether it is in the beneficiary’s interest to have payments made through a representative payee. Congress also recognized the need to oversee the performance of those individuals whom we select to receive benefits on behalf of a beneficiary. To that end, it required us to establish a system to monitor the performance of the representative payees we select, so that we can ensure that the representative payee uses the benefits in the best interest of the beneficiary. We monitor representative payees to ensure they continue to meet our qualifications and spend benefits appropriately. Part of my testimony today will describe the various monitoring activities we undertake to help deter misuse. But first, I would like to briefly comment on the responsibilities that a representative payee carries out on behalf of beneficiaries. Being a representative payee requires a significant commitment of time and attention, with few rewards beyond the satisfaction of helping someone in need. Yet millions of Americans rise to this challenge every day. Our reviews show that representative payees generally manage beneficiary funds appropriately, and our monitoring policies are intended to identify the exceptions. We developed an improved business process for sharing misuse information with the Department of Veterans Affairs (VA). Our new process provides detailed guidance on when and how misuse information should be shared, and ensures proper transmission of data. Both agencies act upon the shared information to initiate misuse investigations and possible changes in payees or fiduciaries. This effort modernized the representative payee computer system, which our employees use to take and process applications from individuals who want to serve as a representative payee. The new web-based application is easier to navigate and helps to ensure policy compliance. Prior to implementing eRPS, applications were taken through an older computer system, or through paper forms. The web-based application includes more search features and selection alerts, which enhance our ability to investigate representative payee applicants. The new selection alerts highlight specific problems, such as poor representative payee performance or pending misuse allegations, thereby providing our employees with valuable information about a representative payee’s suitability. We have numerous enhancements planned for this system, including a requirement to have employees thoroughly document capability determinations. We plan to implement this last enhancement in 2017. We commissioned the National Academy of Medicine (NAM) to explore and make recommendations regarding our capability policy, and they released their report in May 2016. Based on its findings, we published revisions to our capability policy on January 26, 2017. As part of these revisions, we added new questions our technicians should ask a third party when determining a beneficiary’s capability; added comprehensive instructions on documentation in our web-based eRPS system; and streamlined the instructions to improve user understanding. We have scheduled a nationwide video training for field office employees for April 2017. The key to our monitoring and oversight of representative payees is our site review program. We recently redesigned and strengthened our program. Before describing those improvements, I will summarize the site review process we used through late 2016. The Social Security Act requires us to do site reviews for 1) fee-for-service (FFS) payees; 2) organizational payees serving 50 or more beneficiaries; 3) individual payees serving 15 or more beneficiaries; and 4) State mental institutions participating in our on-site review program. In addition, we conduct discretionary reviews on some other organizational and individual payees beyond those required in the Act. We select payees for a discretionary review using a misuse predictive model that we developed based on common characteristics in known misuse cases. We conducted 2,590 representative payee reviews in FY 2016. In our reviews, we examined the representative payee’s financial records and supporting documentation. 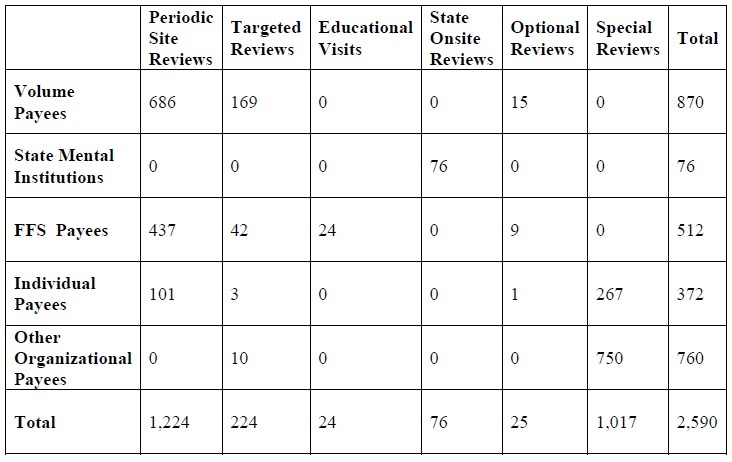 We conducted onsite reviews at 76 State institutions. All of the institutions reviewed were performing satisfactorily with no significant problems or corrective recommendations noted. As noted earlier, we redesigned our site review program. In July 2016, we awarded a new contract to Information Systems and Networks Corporation (ISN) to assist us. ISN will conduct a greater number of representative payee reviews and beneficiary interviews, targeting high-risk representative payees and including parents and spouses, to ensure we review all payees. ISN will also be conducting home visits to more effectively identify misuse of benefits and ensure that beneficiary needs are being met. Based on the results of the site review, ISN will conduct follow-up activities with representative payees on fiduciary issues, such as recordkeeping problems or bank account titling issues. Our own Operations staff will continue to address any programmatic issues that arise. We will phase-in the contractor services over three phases, during which time field offices will continue to do some reviews. Ultimately, at the end of the phase-in period, our field offices will no longer conduct site reviews. The final phase of our plan will bring the total number of reviews we conduct to 5,000 – nearly double the number we completed in FY 2016. Our ability to implement the plan will depend on the availability of agency resources. We have created a centralized monitoring team (CMT) to oversee the site reviews and to ensure consistent application of our policies and procedures. The CMT replaces our prior monitoring oversight, which was decentralized throughout the country. To support this new team, we are developing a new representative payee monitoring control database to ensure comprehensive review tracking and histories. To ensure the quality of the review reports and documentation submitted by ISN, the CMT reviews every report. With the exception of certain State mental institutions, we require all representative payees to submit an annual representative payee accounting report that details the use of beneficiaries’ funds. Social Security law and regulations require representative payees to use the benefits they receive for the current needs of the beneficiary and in the beneficiary’s best interests. Representative payees are responsible for reporting on the use of benefit payments. The representative payee must complete a paper representative payee report or an online report annually. We may also request that a representative payee complete an accounting report whenever we receive information that raises a question about the representative payee’s use of monthly benefits or conserved funds. Field office employees may conduct an interview when the representative payee's responses on the accounting report indicate possible improper use of benefits or a change in custody, or when the representative payee fails to complete the initial and second request for an accounting report. We also may interview the beneficiary and custodian (if the custodian is someone other than the representative payee) to confirm information provided by the representative payee and to ensure the beneficiary's current needs are being met. We investigate indications of misuse of funds or a representative payee’s unsatisfactory performance, and take appropriate actions to protect the beneficiary’s best interests. If the representative payee does not respond after repeated attempts by the field office to obtain the required accounting report, we will consider changing the representative payee. If we determine that the current representative payee is no longer suitable, we will look for a successor representative payee. If a new representative payee is not readily available, we generally can pay the beneficiary directly while we continue to search for a suitable payee. The Office of Inspector General (OIG) conducts audits to help us identify areas where we can improve our representative payee program. We analyze their findings and seek to address their recommendations. OIG’s efforts help us to detect and prevent fraud by identifying changes we can make to our systems and documentation policies. For example, OIG cited in one of its audits that there were representative payees who had representative payees. While this affected less than one-half of one percent of representative payees, it is nonetheless critical to fix the issue. To satisfy the OIG report recommendation regarding this audit, we created a new representative payee system (eRPS) that facilitates documentation of representative payees across our field offices. We have incorporated new alerts to remind technicians prior to proceeding through an application, so that we can prevent beneficiaries with representative payees from becoming representative payees. With each systems enhancement we carry out, we ensure that field offices document information regarding anything related to representative payees that will in turn improve our monitoring of representative payees. Additionally, the new system allows field office employees to create, track, and store allegations of misuse from beginning to end. Lastly, we meet with your staff every quarter to brief them on the progress we are making in improving our representative payee program, and to solicit their input on how we can make it better. We will continue to identify and pursue innovative approaches to serve those beneficiaries who need us the most, and we appreciate the ongoing collaboration with your team in this effort. We are committed to improving our representative payee monitoring program. We believe our new site monitoring program and more robust capability policy are examples of important steps in the right direction, but we do not intend to stop there. We must continue to look critically at how we use our limited resources to provide the best outcomes for our beneficiaries and for those who assist them. We must continue to be inventive in our approach, and willing to adjust our course when necessary. We look forward to working with Congress and other stakeholders to help ensure that we have an efficient, effective monitoring program that identifies payees who are not acting in the best interest of our most vulnerable beneficiaries.